Ads are all over the Internet, and some of them are intrusive or annoying. There are ad blockers that can help block most if not all of the ads you see so you can do your web surfing seeing them. Just follow these simple steps to get an ad blocker installed and for this tutorial, the blocker will be AdBlock Plus (alternatives include AdBlock and Ghostery). 1. Browser- Open your web browser you wish to install. In the address bar, type adblockerplus.org and press Enter. 2. 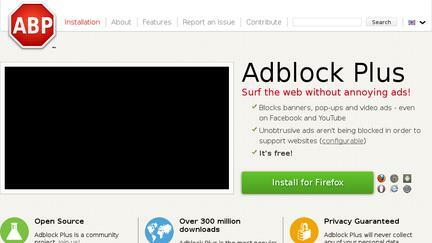 Installation- AdBlock Plus will recognize your browser. To the right, you will see the different browsers it can be installed on. Click the green Install button. 3. Installation instructions- The installation instructions will be different depending on the browser you are using. For example, if you are using Chrome, a pop-up will appear giving you the option to Add to Chrome or cancel. It will tell you what it does if you install it. Click Add to continue. For other browsers, your installation instructions will be different. In any case, follow the installation instructions and confirm, giving the ok for the download or installation to continue. 4. Configuration- Once AdBlock Plus is installed, you can configure it further by adding your own filters, meaning other websites you can block ads from in addition to what it does automatically. Note: Many website's ads are not intrusive or annoying. Consider whitelisting sites you support or visit regularly, so that they receive the revenue from advertising. To whitelist a site, right click on the AdBlock Plus icon next to the URL bar in your browser. Click options, then choose the tab for whitelisted domains. Enter the URLs for websites you support or have unobtrusive advertising there and click "Add domain."